I wanted to write a basic tutorial on how to create some simple but impressive laser effects for beginners (like me!) All this setup takes is a computer, an old Laser Disc player and some wire cutters. I found these parts in an old laserdisc player from Pioneer circa 1980. 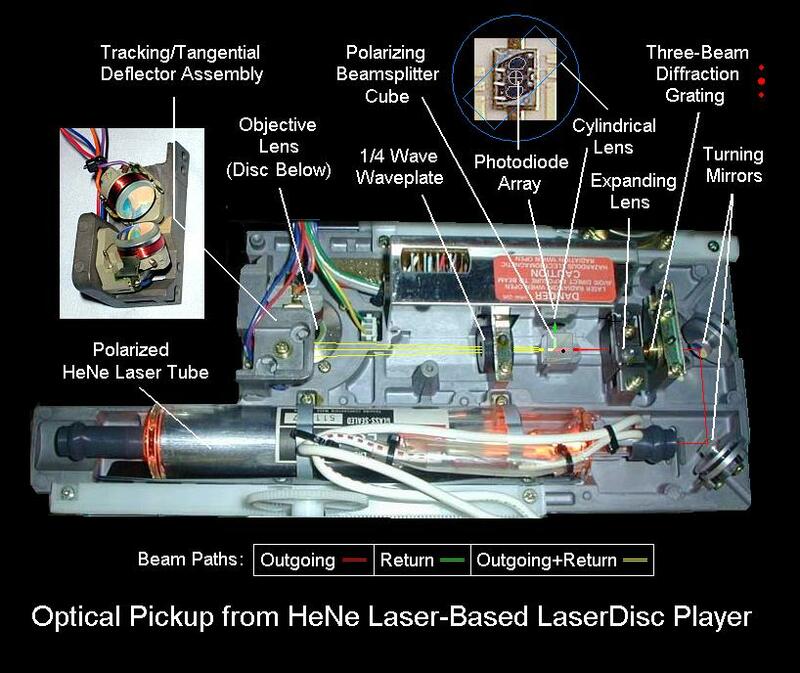 These were used to align the beam from the HeNe laser on the disc itself (as best as I can determine.) They are essentially two little mirrors which rotate proportionate to the input voltage. Essentially, they act like little speakers! While speaker level output will likely fry these things, line-level out will work perfectly. Simply splice some RCA connectors on the back and connect it to your sound card. For ease, you may also want to buy an RCA to 1/8 inch mini plug connector. This will allow you to connect it to your computer, ipod, etc. without hassle. As far as performance goes, don’t expect too much. This is a low-end open-loop setup that probably only responds to frequencies below 150Hz. But - it is great to visualize music and for beam effects. You can still make the beam bounce around and you do have more control with this method than simply shining the beam at a speaker+mirror. For those less inclined to find the Pioneer LD-660 (I think…) or another , you can buy the part itself from eBay. This seller seems to have lots of them but charges way too much and pretends not to know where they are from. Lastly, as a side note - unless you will be sticking with red lasers, you will need to purchase broadband mirrors for this contraption. I ordered two thin circular first surface mirrors from Anchor Optics for ~$15. Glue them on top of the IR mirrors and you should be good to go! I use a program called LaserLine to generate the patterns. The left audio channel deflects the beam on the X-Axis and the Right channel deflects the beam on the Y-Axis. LaserLine generates different waveforms for each channel and the difference, created the spiral patterns the user sees. To visualize the patterns without a scanner, an audio scope that plots Left vs Right channels in 2D space will generate the same effect. For this, I use a program (in demo mode...) called ProPhase.